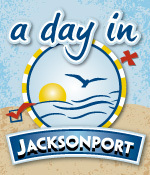 Jacksonport, Wisconsin - Parks and More Along the Shore! Be sure to check out Whitefish Dunes State Park, located just south of Jacksonport, where you can hike amongst the tallest sand dunes in the state of Wisconsin. And don’t miss Cave Point County Park, located next to Whitefish Dunes, to see powerful Lake Michigan waves crashing against the rocky cliffs below.